Draft does not forget to dig well, LEOCH devoted to various charitable activities, highly fulfills corporate social responsibility. In recent years, Leoch focus on all kinds of charitable donations have covered many fields such as Culture, education, health, public security, poverty alleviation, and disaster relief. Also, Leoch actively participated in the activities of poverty alleviation in education in Gansu, Xinjiang and other areas in the northwest China, including the establishment of xi 'an university of engineering scholarship and the Western Love Education Foundation, which contributed to over 1,000 students across the country. Leoch also established the “Poverty Alleviation Foundation” within the enterprise. To grant unpaid support to employees who have difficulties in family life within the company. In addition, Leoch has donated to local disaster areas for many times and has been praised by various government departments. Leoch has a clear understanding of the environmental impact of its business on the environment. Therefore, it formulates comprehensive environmental policy to manage the discharge of various pollutants. Relevant control procedures have been developed for wastewater, exhaust gases and solid wastes, etc. The operation processes are closely monitored and innovative technology is actively pursued for continuous improvement of environmental performance. 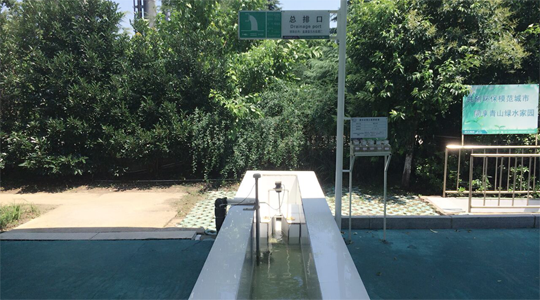 LEOCH has effectively controlled the industrial wastewater and domestic sewage generated by the activities, products and services of LEOCH, and also formulated the “Sewage Treatment Operating Procedure” for handling wastewater properly. The production plants of LEOCH have installed an internal sewage treatment facility to handle the wastewater generated by LEOCH and to ensure the compliance with discharge limit before release to the external sewage system. This prevents impact to the environment from the influence of water pollutants on pH and lead content. Leoch also controls gas emissions effectively to prevent the impact on the environment from atmospheric pollutants generated during operation such as sulphuric acid mist, lead fumes, lead dusts, and its compounds. 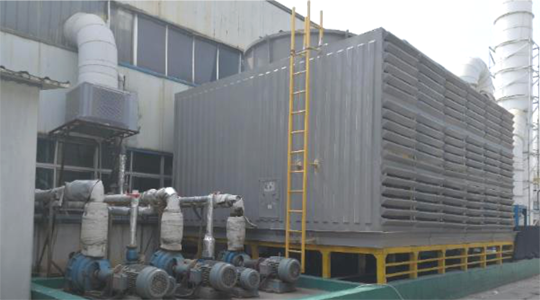 The production plants are equipped with a comprehensive exhaust gas treatment system. Processes that are likely to cause exhaust gases, fumes and dusts are operating under exhaust ventilation facilities, through which exhaust gases, fumes and dusts are channelled in ducts into the treatment facilities. 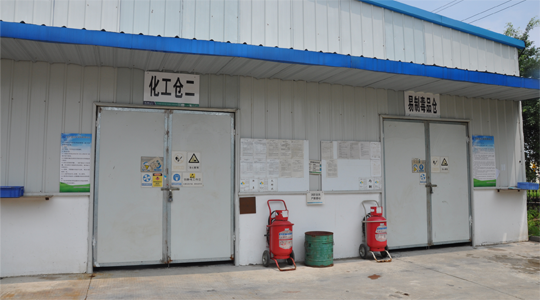 These facilities include lead fume purifier, dust collector, acid fume neutralizer/purifier,etc. Gas emission is allowed to discharge to the external environment onlywhen they comply with the requirements of internal monitoring and those requirements stipulated by the emission permit. In addition to emission control of the aforesaid air pollutants, LEOCH is striving to reduce greenhouse gas (GHG) generation in its operation. 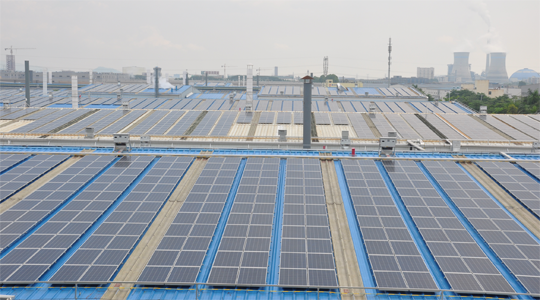 LEOCH is actively expanding the use of clean energy to reduce GHG coming from the conventional power generation, such as by promotion of solar energy projects. Living areas within the operation boundaries (such as bathrooms and canteens in the dormitories) have fully switched from the use of coal to natural gas for reducing GHG drastically. LEOCH has established waste classification system. 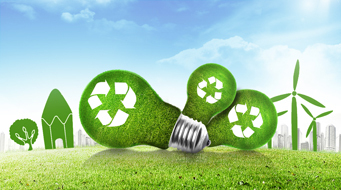 Wastes are recycled as much as possible or disposed timely if they could not be reused. Wastes shall be disposed in a controlled manner and also waste handling vendors are contracted on the specified requirements for handling of general wastes. For solid wastes, LEOCH classifies them firstly into two main categories according to their hazards: hazardous wastes and non-hazardous wastes, which are further divided into four sub-groups based on the recyclability. Solid waste includes those liquid and gas wastes which are stored in containers and not directly discharged to external waters and atmosphere, for example: waste oil and waste cleaning solvent in container. LEOCH pays attention to environmental protection and is striving to realize reasonable utilisation of energy and resources. Appropriate measures are advocated for enhancement of utilisation rate. During the phases for development of industrial technology and equipment selection, LEOCH gives priority to equipment and products that are of low power consumption or higher energy efficiency. For equipment of high power consumption, they will be gradually replaced by technology and equipment of low power consumption. Technology re-engineering is planned and implemented to the existing technology and equipment for process optimisation and enhancement of energy utilisation rate in various production departments. Departments shall minimise the equipment operating at production idle time, and shall shut off the power supply to those equipment at non-production time interval. Operation load of the equipment is flexibly adjusted according to the change in production planning. 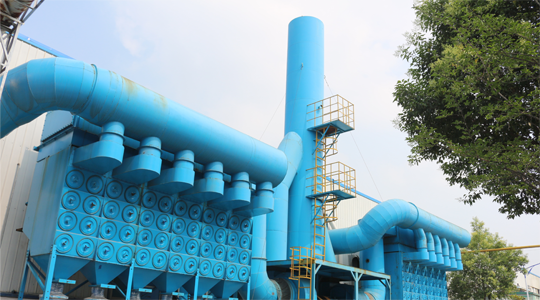 LEOCH makes best utilisation of the wastewater treatment system. Treated wastewater is recycled for use to reduce the consumption of fresh water. For example, LEOCH recycles waste acids generated from the acid-adding battery charging process in each assembly plant. 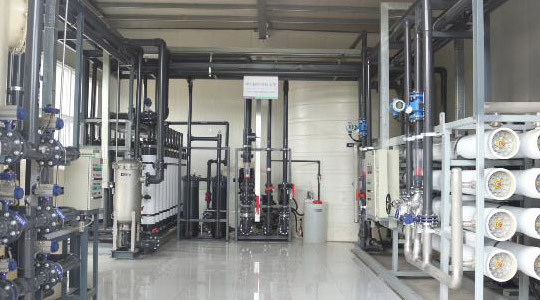 In-house sewage treatment facilities are installed with reuse water pools, from which treated wastewater is reused in factory cleaning, water consumption process within environmental protection facilities and toilet flushing, etc. 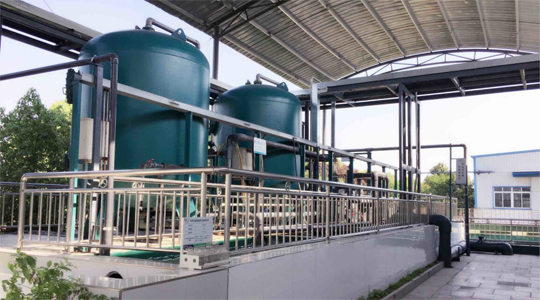 In addition, the production plants are installed with rainwater collection system in which the collected rainwater will be gone through the wastewater treatment and then be reused. Apart from frequent reminding employees and visitors of water conservation, LEOCH is striving to continuously reduce water consumption by equipment innovation, technology optimisation and enhancement in management practices, etc. Moreover, regular clean production audits are conducted to monitor and identify the processes capable of reducing water consumption; this prevents the occurrence of unnecessary water consumption. L eoch collects and categorises the recyclable solid wastes which will be used internally as much as possible, for example: wooden pallets and carton boxes are reused internally; scrap plastics from the production processes are recycled for production of plastic pallets which are used within the factory and will be recycled for production of new pallets after damaged. In the packing process, leoch prioritise the use of degradable and recyclable packaging materials (such as wooden pallets, cartons, iron boxes, etc.) to reduce the use of plastic packaging materials. Whenever plastic packaging is deemed necessary, materials of less weight or more environmental-friendly should be adopted as far as possible. Leoch general principle on paper utilisation is the preference in using environmental-friendly paper, printing on both sides and whenever possible the deployment of electronic document management system to reduce the use of paper. Leoch developed an internal document management system, through which documents are distributed, received and acknowledged. This encourages employees to use electronic files and hence considerably reduce the release of paper document. In addition, leoch adopts the SAP-ERP system and measures such as internal e-mail communication to reduce the use of papers. In response to the public's concern over environmental protection, leoch is striving to satisfy the demands of the society and customers, and realises the green culture in procurement, production management and employee training. For assurance of product compliance with environmental protection parameters, during the product design and development stage, leoch strictly controls the use of materials for production and priority is given to degradable or environmental-certified materials. For materials with environmental risks, leoch requests suppliers to accompany the materials with third party RoHS test reports for assuring the control of hazardous substances within the compliant range. 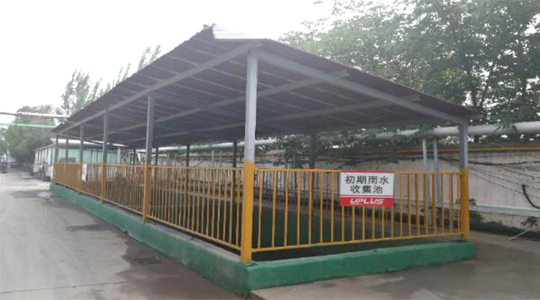 Environmental performance is also considered in the selection of suppliers.Suppliers are required to sign “Agreement for Environmental Protection” and to submit RoHS test reports on regular basis. Also, suppliers are subject to the on-site environmental assessments arranged by leoch. In addition, leoch requires the important raw materials to be verified for environmental compliance. It includes establishment of guidelines for controlling the content of the relevant heavy metals and plasticiser as well as requirements on the relevant testing frequency and specifications. Leoch adheres to ISO14001 environmental management system for identification and assessment of all environmental aspects. Schemes are developed to monitor the significant environmental aspects for ensuring the emissions of exhaust gases and wastewater in compliance with the specifications stipulated in the national standards and emission permits.Production processes are assessed to identify the source of hazardous waste generation and the associated action plans are formulated to reduce hazardous wastes, such as formulation of effective measures to reduce the discharge of acidic wastewater and lead dust, return of used chemical containers to suppliers for recycling and treatment, etc. Leoch appoints dedicated department to maintain and ensure proper functioning of the treatment facilities for wastewater and exhaust gases. “Emergency Plan for Abnormalities in Environmental Facilities” is developed to guide the actions required for prevention of environmental pollution in event of malfunctioned facilities for sewage treatment, dust removal or exhaust gas purification, etc. Leoch annual training programme and new employee's orientation programme both cover the requirements of environmental protection, which include basic knowledge of the environmental management system, identification and control of environmental attributes and skill training of the specialised positions such as the proper operation of specified environmental facilities. In 2017, leoch also continued the training programme of environmental protection for raising the awareness and competence of employees. The content covered the foundation knowledge in environmental protection, environmental laws and regulations, and knowledge of handling solid wastes, etc. There was a total of 2,444 participants in the environmental protection training in the year, which amounted to 4,884 hours of relevant training courses.